Born in Omaha, Nebraska in1958, James Wolford is an American landscape painter with a focus on marine and architectural subjects. After graduating from The Kansas City Art Institute in 1981, he was offered a scholarship and a position as a teaching assistant at Boston University school of fine arts where he completed his Master of Fine Arts. In 1984 James moved from the East Coast to Colorado to pursue his desire to paint scenes of the modern West. In 1991, his innovative use of color was recognized by an award from the Colorado Federation for the Arts. In 1996, he relocated to the coast of Maine, which has traditionally drawn artists to its rocky shores and historical villages. His work is featured on the cover of The Art of Monhegan Island, published in 2004. James frequently paints urban subject matter. Capturing the subtleties and intensities of light, whether on the face of a city building or a rural landscape, is essential to his work as a contemporary realist. Many of his paintings are awash in the light that exists for only a short period of time in the morning or late afternoon. His fascination with the many facets of water, including the seemingly abstract qualities of reflections, provides continual inspiration. Although his paintings evoke a strong sense of place, James chooses his subjects primarily for their formal qualities. There usually is some human element in his paintings, whether it is a single human being or man made object. James often takes subjects considered mundane and transforms them by finding and pointing out their inherent beauty. 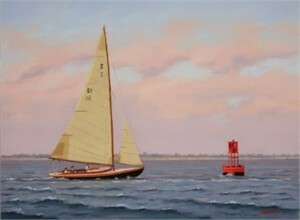 James now resides in the Boston area and is a member of the Copley Society of Artists and also a signature member of the American Association of Marine Artists. James accepts commissions of any size anywhere in the world. James Wolford Born in Omaha, Nebraska in1958, James Wolford is an American landscape painter with a focus on marine and architectural subjects. After graduating from The Kansas City Art Institute in 1981, he was offered a scholarship and a position as a teaching assistant at Boston University school of fine arts where he completed his Master of Fine Arts. In 1984 James moved from the East Coast to Colorado to pursue his desire to paint scenes of the modern West. In 1991, his innovative use of color was recognized by an award from the Colorado Federation for the Arts. In 1996, he relocated to the coast of Maine, which has traditionally drawn artists to its rocky shores and historical villages. His work is featured on the cover of The Art of Monhegan Island, published in 2004. James frequently paints urban subject matter. Capturing the subtleties and intensities of light, whether on the face of a city building or a rural landscape, is essential to his work as a contemporary realist. Many of his paintings are awash in the light that exists for only a short period of time in the morning or late afternoon. His fascination with the many facets of water, including the seemingly abstract qualities of reflections, provides continual inspiration. Although his paintings evoke a strong sense of place, James chooses his subjects primarily for their formal qualities. There usually is some human element in his paintings, whether it is a single human being or man made object. James often takes subjects considered mundane and transforms them by finding and pointing out their inherent beauty. James now resides in the Boston area and is a member of the Copley Society of Artists and also a signature member of the American Association of Marine Artists. Selected publications: Landscapes of Colorado, by Ann Scarlett Daley and Michael Paglia (2007) Cover for “The Art of Monhegan Island“, by Carl Little and Arnold Sckolnick; Forward by Jamie Wyeth (2005) James accepts commissions of any size anywhere in the world.